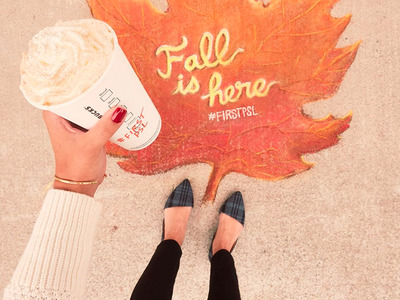 StarbucksStarbucks’ Pumpkin Spice Latte is back earlier than ever this year. Starbucks’Pumpkin Spice Latte is returning to menus on August 28, its earliest official launch date ever. The coffee giant’s reputation has taken a beating so far in 2018, leaving Starbucks scrambling for solutions. The early launch date for the Pumpkin Spice Latte could be a strategy to boost sales in the fourth quarter while growing the chain’s cold-drink business. Starbucks’Pumpkin Spice Latte is back earlier than ever this year. This week, Starbucks confirmed that the Pumpkin Spice Latte will return on Tuesday, August 28, the drink’s earliest official launch date ever. The early launch date comes at a time when Starbucks desperately needs a win. This year has been a tumultuous one for the chain. In April, CEO Kevin Johnson was forced to apologise after a video of two black men being arrested at a Philadelphia location of the coffee chain went viral. In response, the chain closed down all locations for anti-bias training. Starbucks’ reputation took a major hit following the arrests. In May, the company’s workplace reputation hit a 10-year low, according to YouGov BrandIndex data. Soon after employee anti-bias training, Howard Schultz, the chain’s then-chairman and former longtime CEO, who essentially served as its founder, announced he would be leaving the company. And, when the company reported its most recent quarter of earnings in late July, same-store sales in the United States increased just 1%, negatively impacted by poor Frappuccino sales. The fall of the Frappuccino serves as an interesting parallel to the dominance of the Pumpkin Spice Latte. Both represent Starbucks’ ability to drive sales by not being a snobby, upscale coffee shop, but instead selling drinks that cost more than a cup of coffee and appeal to people – especially younger customers and women – with a sweet tooth. For a while, Frappuccinos represented a guaranteed sales boost for Starbucks, with the super-short-lived Unicorn Frappuccino being celebrated as a viral success. But this year, the chain cancelled its well-known Frappuccino happy-hour deal as sales slumped. “It really hasn’t been worth it over the last two years and wouldn’t be worth it this year,” Starbucks CFO Scott Maw said of the promotion during a JPMorgan forum in March. The downfall of the Frappuccino took a powerful weapon out of Starbucks’ arsenal. However, despite being on the menu for nearly 15 years, the Pumpkin Spice Latte has maintained its power with customers, which could help explain why Starbucks wants to bring its launch date a little bit earlier in the year. “We know the Pumpkin Spice Latte is a beverage that Starbucks customers wait for with anticipation all year, and we’re excited to give our fans the opportunity to get their fall fix a little earlier,” a Starbucks representative said in an email to Business Insider. This week, Piper Jaffray lowered its rating on Starbucks – from buy to neutral – in part because comparable sales are tracking at 2%, which is lower than the consensus of 2.8%. Starbucks’ next quarter represents the 13-week period that started on July 1 and will end in early October. Making sure that PSL season goes on as long as possible and lasts for as much as the fourth quarter as possible is a helpful way to boost these sales. Starting Pumpkin Spice Latte season in August instead of the first week of September carries some risks, as the seasonality of the drink is key to its power. However, there could be a surprising secondary benefit with the slightly earlier launch. Much of Starbucks’ recent growth has been in cold drinks. Over the last five years, Starbucks went from cold drinks making up 37% of sales to more than 50% of sales. While the weather won’t change much between the end of August and early September, an August launch date may be the slight push that customers need to order iced versions of the PSL – drinks Starbucks has been pushing for at least the last two years. With iced PSLs on the menu, customers can incorporate more variations into their routine and boost sales as a whole. And, when Starbucks is in a rough place, there are worse things to do than go all-in on Pumpkin Spice Latte.